All of a sudden it seems that everyone is abuzz about aebleskiver. My first reaction was "What?". But when I was treated to some of these Danish pancake spheres prepared with expert aplomb by a friend in Salt Lake City, I understood the appeal. I'm a big fan of pancakes all all shapes and sizes, and these balls of buttery, eggy fluffiness are mouthwatering when served hot from the pan. 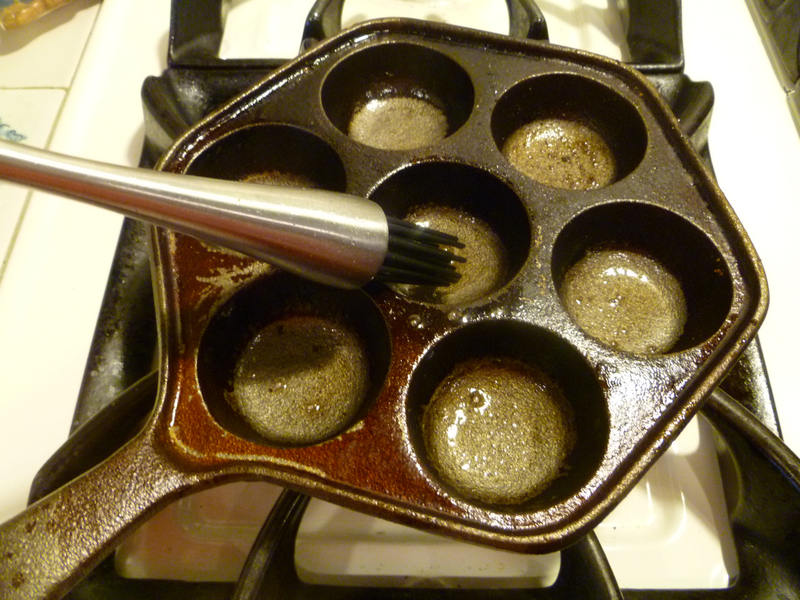 So I asked for an aebleskiver pan for my birthday (or rather I snatched one up in the hardware store when we were out buying gardening supplies and shoved it into my husband's hand before dashing off to prevent my three year old from toppling over a large display of assorted nails). 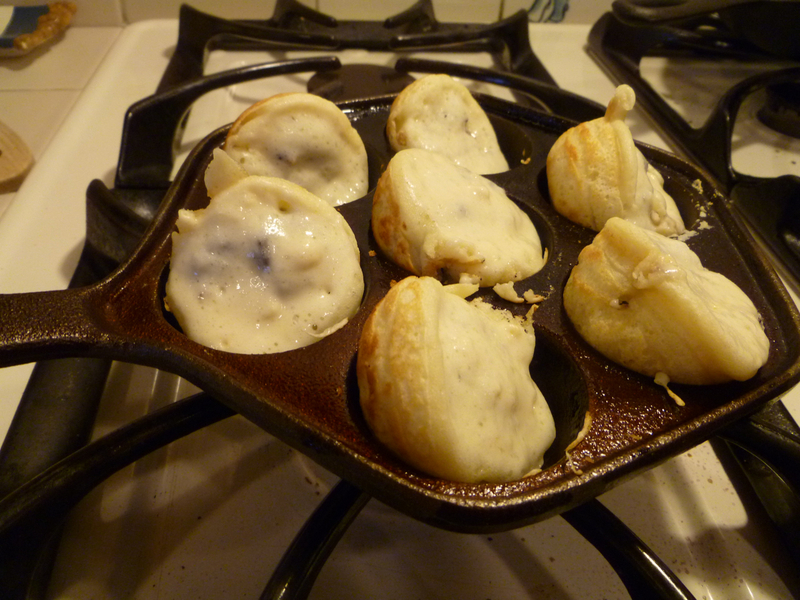 Back home, I seasoned the pan, and then watched some Youtube videos on making aebleskiver. My first reaction was "You've got to be kidding!" The implement used is a skewer! Somehow you are supposed to take a pool of liquid batter, poke at it with a thin stick, and magically produce a spherical popover. I prepared the batter, which is fluffy from whipped egg whites and tangy from buttermilk. For the first batch I tried, I put in dollops of jam. and then poke and prod them around until they become spherical. 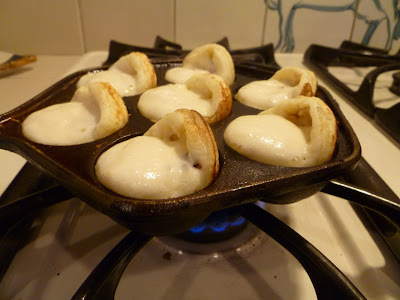 It turns out that there are many ways to produce non-spherical aebleskiver, such as flat discs or basket-shaped structures with cavernous gaping holes. Luckily, they all taste good. 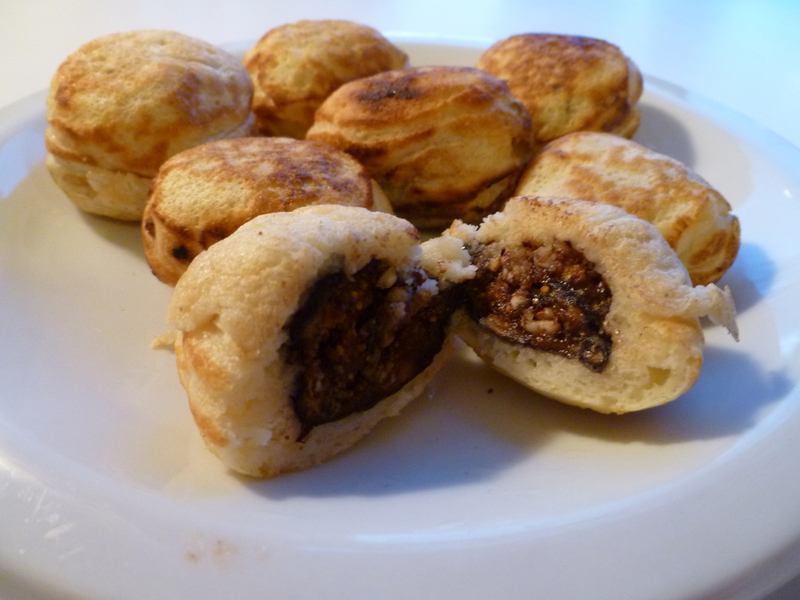 Emboldened by this first attempt, and with remaining batter, I was inspired to create a dessert aebleskiver of a stuffed dumpling stuffed with a stuffed fig. A dumpling turdunken. To soften the figs, I simmered them in a little red wine. 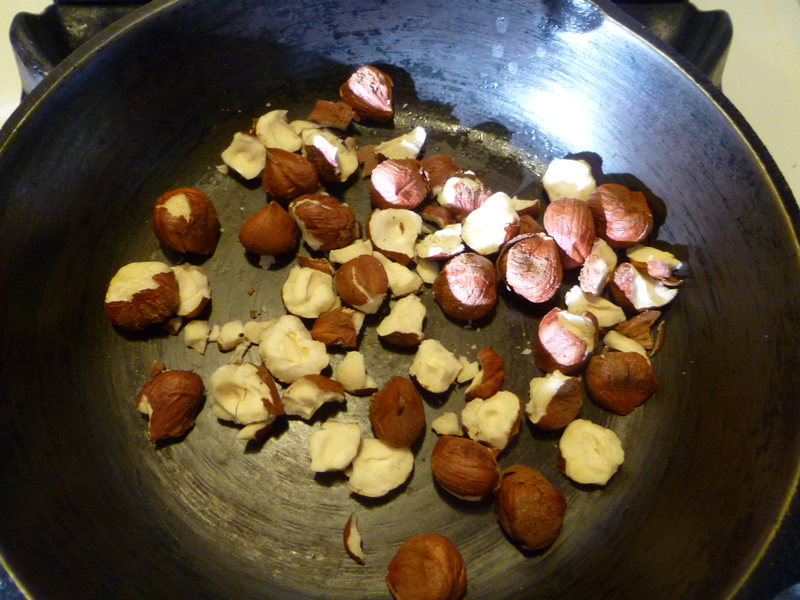 Meanwhile, I toasted some hazelnuts in a dry skillet, and chilled some chocolate chips. Then I pulsed these in a food processor to make a coarse meal. 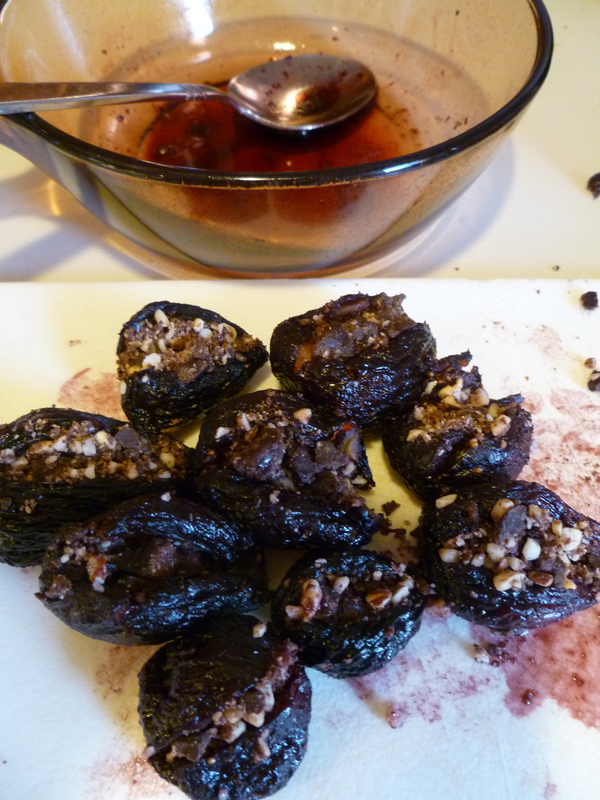 To stuff the figs, I made a slit down the side, pressed down the flesh and spooned in the chocolate and hazelnut mixture. Then I prepared some aebleskiver. 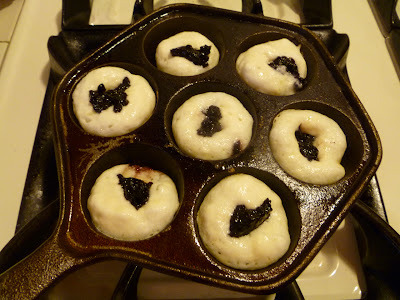 It turned out that having a solid base in the middle made the turning process much easier and produced aebleskiver whose volume more closely approximated the cube of their radius times pi. 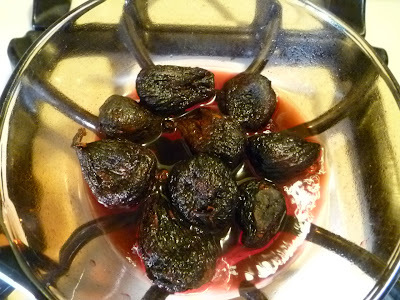 They were also delicious. As a last minute inspiration, I mixed up the reduced fig-flavored wine with a little creme fraiche, which made a lovely accompaniment for the fig filled aebelskiver. As a pleasant post birthday surprise, this recipe was picked as an editors' choice on the food52 website. Heat an aebleskiver pan and butter well. Fill each of the cavities to about 1/2 the height with batter. Then place a stuffed fig into each well and top with a little more batter to cover the fig and fill the well. Cook for about a minute. With a skewer tip the dumpling to one side so that the cooked half dome is perpendicular to the pan and cook for another minute. Now catch each dumpling on the corner between the first half dome and the second half dome and rotate this to the top, so that the least cooked face of the dumpling points downwards. Keep rotating the dumplings for a few more minutes until they are golden brown on all sides and cooked through. This sounds SO delicious! Have you considered other fillings? Nutella? With a hazelnut in the middle? The list could go on . . .
we should experiment some time for a belated birthday celebration. OMG! 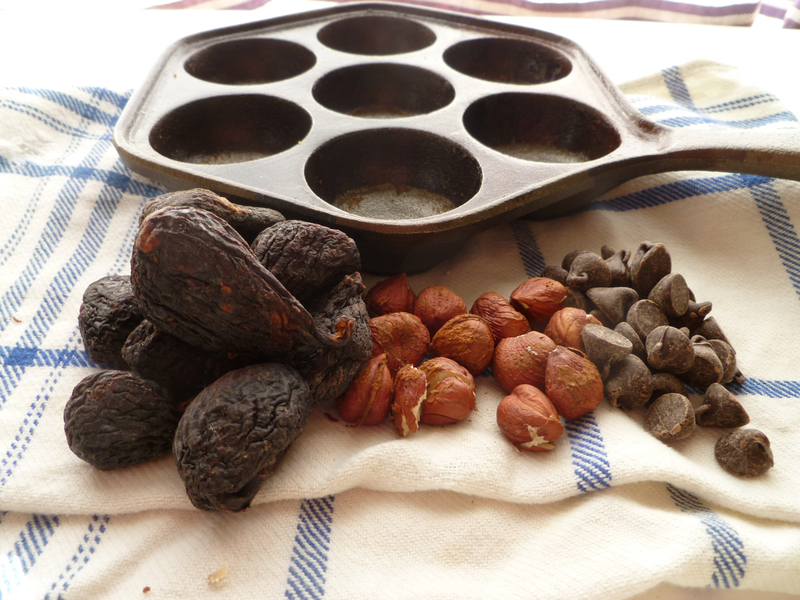 You have an abelskiver pan?! Mind if I move in so I can have them everyday?? Just kidding. Fantastic purchase and happy happy birthday! !